Universal Orlando launched a brand new smartphone application for their parks, as well as high speed WiFi. With the new application, you can view wait times, see interactive park maps, customize a favorites list of all your top attractions, as well as much more. This application is for download now in the Google Play store or on iTunes for Apple products. To go along with the demand of having a high quality smartphone application, Universal also announced today that there is now high speed WiFi in all the parks as well as throughout City Walk! In its pursuit to enhance theme park mobile technology, Universal Orlando also announced the debut of FREE park-wide mobile Internet access, with Xfinity WiFi, the nation’s largest Wi-Fi network. High-speed Wi-Fi is now available across both Universal Orlando theme parks – Islands of Adventure and Universal Studios Florida – and at Universal CityWalk. Coverage includes all main walkways, most indoor dining and shopping venues, plus attraction queue lines. To connect to Xfinity WiFi hotspots, guests should select the “xfinitywifi” signal (or SSID) on their mobile device and follow the prompts to access the free service. In-park Xfinity WiFi will allow guests to run the Universal Orlando mobile app, along with other web-based experiences, at a faster rate while conserving data usage. 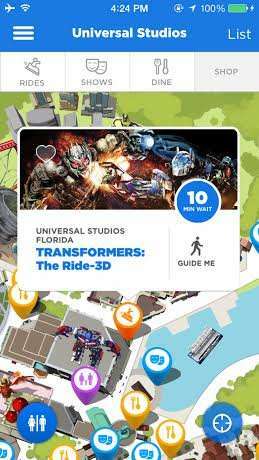 The Official Universal Orlando Resort App boasts several unique features, including an interactive way-finding function that utilizes GPS-enabled maps and real park images to visually guide guests step-by-step to their desired attraction. The app’s in-park features provide information on special show times, ride updates and more, while its intuitive sorting feature allows guests to explore Universal Orlando by park, by activity or by amenity. The app will undergo continuous enhancements over time, with plans to add features like e-commerce purchase capability, customizable itineraries, social sharing and more. To download The Official Universal Orlando Resort App, visit the Apple or Google Play app stores on your mobile device.